My mum has a bit of a herb garden going on – a good one too. It works out great for me as when there’s too much growing I come and take it off her hands. At the moment it’s the basil. Some would say that you can never have too much basil, well apparently you can! I love basil when accompanied with something like bruschetta or pasta sauce (pretty much anything with tomatoes), but not loose leaves in a salad. I can’t seem to handle eating an actual leaf of basil. So with all this basil, there was really only one thing to make – Pesto. You really can’t go wrong when making homemade pesto. There are 6 key ingredients, and the amount is really up to you – I like a really oily pesto so I tend to add more olive oil than the norm. Below is a basic recipe that will make enough for 4 plates of pasta, however you can increase the quantity for salads, marinades, dips, or just spread on toast. If you have a pestle and mortar, please use this. Pesto is at its best when there is a mix textures – chunks of pine nuts, smooth basil paste, and blots of oil. You get to taste each ingredient this way. 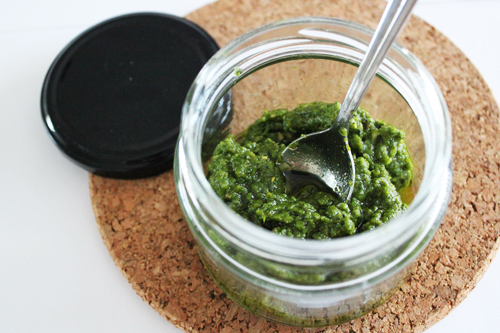 A food processor is still good, but it tends to blend the pesto into a fine paste. This will last in the fridge for a couple of weeks, but make sure you drizzle a decent amount of olive oil on top so it creates a protective layer. Otherwise you can freeze pesto for a couple of months. If using a pestle and mortar, start by grinding the garlic in the salt and pepper. Add half the pine nuts and keep grinding. Then add half the basil, the rest of the pine nuts. Keep grinding. Add the rest of the basil and the parmesan, and a drizzle of oil. As you grind, taste to see if you need more seasoning and oil. The taste will always vary depending on the basil. If using a processor, blitz the basil, pine nuts, garlic and seasoning. Add the parmesan and oil and continue blitzing until you are happy with the balance of flavours. To store, put into an airtight container or jar, and drizzle a little more olive oil.